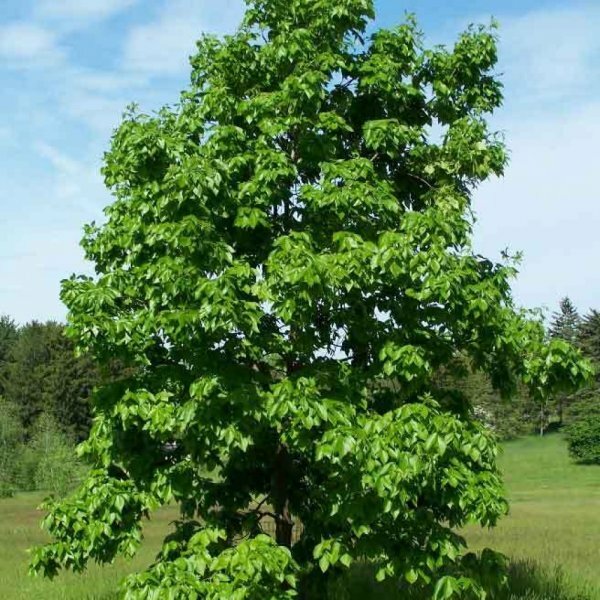 A medium to to large deciduous tree that bears many similarities to shagbark hickory (Carya ovata), shellbark hickory occurs on rich moist bottomlands in eastern North America. It typically has a straight high-branched trunk and a narrow crown formed by relatively short spreading branches. The gray bark divides into large plates, which detach and curl back from the trunk, giving it a shaggy appearance. The pinnate leaves are divided into seven to nine glossy lance-shaped leaflets (compared to shagbark hickory's five), with one large leaflet at the tip and the others paired. The leaves are dark green above, yellow- or bronze-green below, and turn yellow in fall. Inconspicuous flowers appear in spring, with male flowers borne in drooping catkins on second year wood, and female flowers in short spikes at the tips of the new growth. Pollination is by wind. Green, spherical, thick-husked fruits ripen tan or brown in fall. 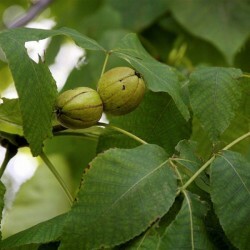 Each fruit contains a tan or brown, hard-shelled nut with a small sweet brown kernel at its center. The flavorful, edible nuts are valuable to wildlife, including large birds. This tree has hard, heavy, dense wood that is valuable for furniture making, wood flooring and tool handles. Slow- and clean-burning, it is excellent for fuel or for adding a pleasing flavor to smoked meats.